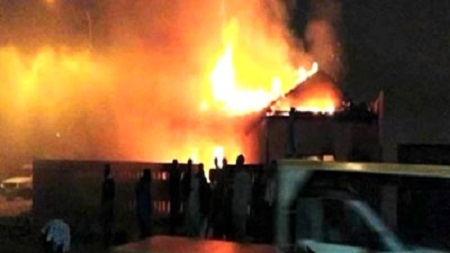 A really huge fire outbreak has caused a lot of destruction inside the Niger State Polytechnic, Zungeru recently. The fire disaster that hit Niger State Polytechnic, Zungeru, last week, destroyed property worth more than N150 million, according to its Rector, Dr. Umar Egbako. Egbako told the News Agency of Nigeria (NAN) in Zungeru on Monday that the inferno destroyed the entire administrative block. “The Rector’s office and other administrative offices, located at the third floor of the senate building, were completely gutted down. “Several computers, gadgets, furniture and office files were destroyed; but we have mobilised every possible effort and ensured that the incident did not affect academic activities,” he said. Egbako said that Gov. Abubakar Bello had already released funds for the rehabilitation of the damaged structures. “We cried out to the governor and he promptly released funds for the rehabilitation of affected structures. Such quick response is very wonderful,” he said.